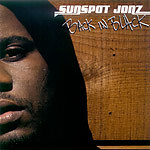 Special limited edition Sunspot Jonz album featuring Murs, Mikah 9 and Himself. ''Back In Black'' is a preview of upcoming releases, including tracks from the Sonny Dreamweaver movie soundtrack, Sunspot's upcoming albums ''Never Surrender'' and ''Fight-Destroy-Rock! '', the ''Everyday Bubble'' album by Spothymn (Himself and Sunspot), plus unreleased tracks from the past few years! Produced by Sunspot Jonz except 2 Big Shawn (of Bored Stiff), 3 Wiz, 5 & 6 Kruse, 11 & 13 Underrated, 12 Anacron, 15 Boac.